There is significant uncertainty ahead for Northern Ireland’s agri-food sector, but consumers are benefiting from lower food price inflation, according to the Ulster Bank. The message was outlined at a key event in the build up to their sponsorship of the 2019 Balmoral Show. Ulster Bank Senior Agriculture Manager Cormac McKervey, and the bank’s Chief Economist NI Richard Ramsey, updated members of the Guild of Agricultural Journalists as well as other stakeholders, on the performance of the local farming and food sectors and related economic issues. 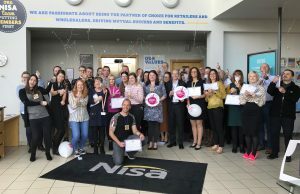 They were joined by Ulster Bank Head of Northern Ireland Richard Donnan, who affirmed the bank’s commitment to supporting the farming and food sectors as they continue to play a key role in the Northern Ireland economy, . Speaking at the bank’s annual briefing in the Ulster Bank Entrepreneur Accelerator in Belfast, Mr Donnan said: “The agri-food sector is a crucial component of the Northern Ireland economy and we are strongly committed to continuing to support it through the funds we have available to lend and the expertise of our team. 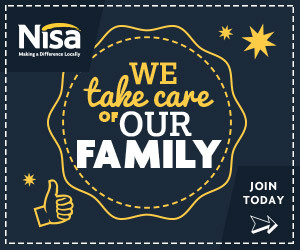 That includes support for farmers and primary producers right through the supply chain, including some of our biggest and best-known food processors. 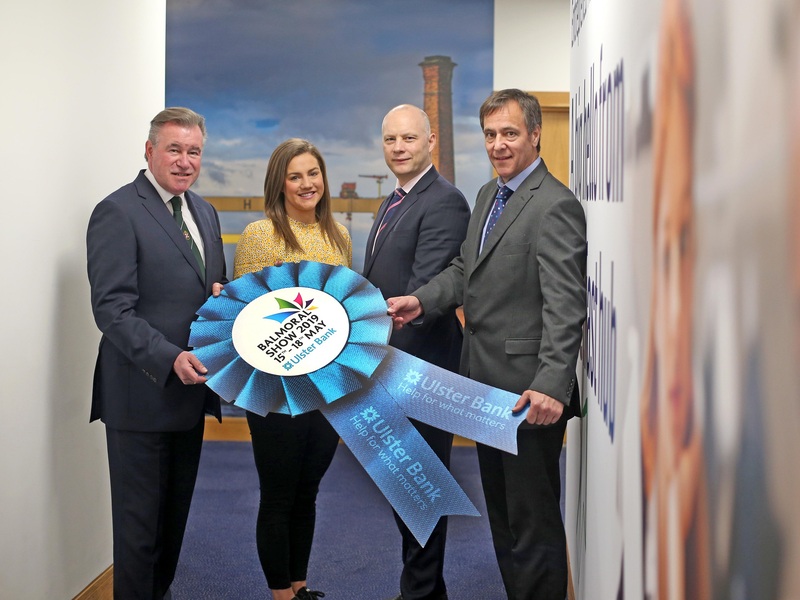 (L-R) Alan Crowe, CEO of the Royal Ulster Agricultural Society; Gabi Burnside, Entrepreneur Acceleration Manager, Ulster Bank; Richard Ramsey, Chief Economist, Ulster Bank and Cormac McKervey, Ulster Bank’s Senior Agriculture Manager pictured at a berakfast event ahead of this year’s Balmoral Show. Cormac McKervey, Senior Agriculture Manager at Ulster Bank said: “Farming in Northern Ireland has enjoyed a relatively positive past 18 months, with the strong recovery in the dairy sector having a big effect on overall performance. The atmosphere in the sector also remains generally optimistic, despite some clear uncertainty related to Brexit. 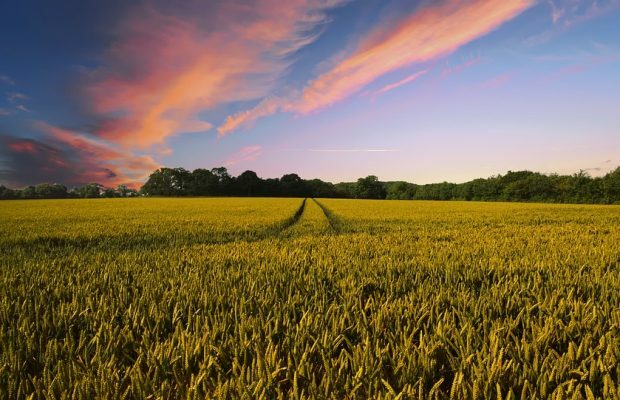 To highlight this, rural land prices rose by 4.4 percent in the past year, and figures released by UK Finance indicate that deposits have increased over the last year. This may be partly explained by farmers holding off on planned capex until Brexit outcomes become clearer. Richard Ramsey, Chief Economist NI at Ulster Bank also pointed out that 2018 was a less positive year for farming in Northern Ireland than the year before. He said: “We need to understand the context, which is that 2017 was a record year for farm income, with an increase of 82 percent in real terms compared to 2016. All-in-all, it has therefore been a positive past 24 months for the agri sector. “The fall in TIFF (Total Income from Farming) last year was driven by high costs of feedstuff. Gross output from farming in Northern Ireland was up one percent, according to the figures, with all sectors recording growth except for the pig sector, the potato industry, and the horticulture sector. Interestingly, egg production saw a record high in 2018, with 149 million eggs produced in Northern Ireland; a rise of 7.2 percent on the year before. 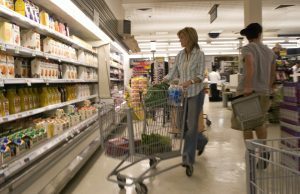 Mr Ramsey added that the environment for the agri-food sector is an uncertain one, but he said that consumers are at least seeing inflation easing, and food prices actually falling, according to the latest data. 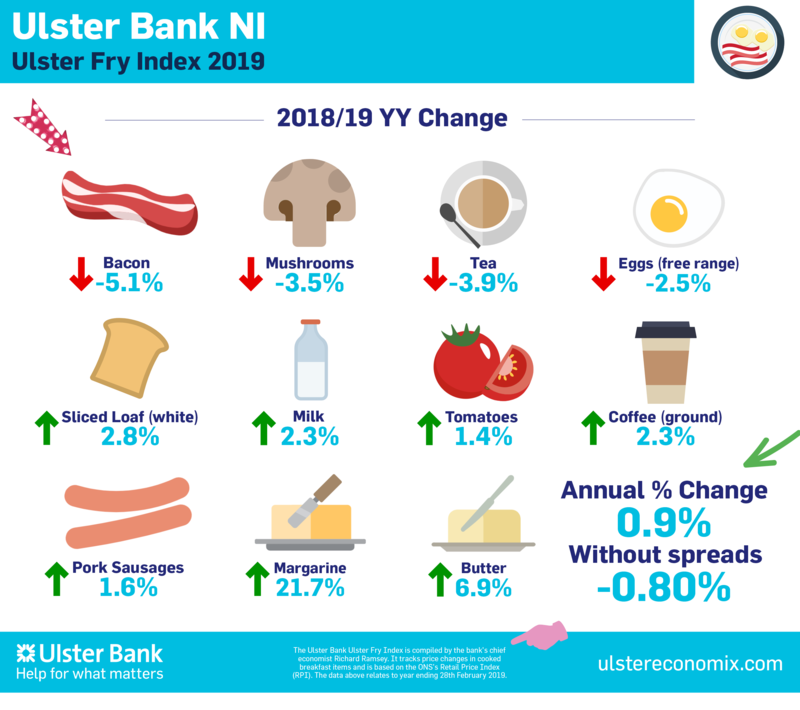 Looking at changes over time, despite the rise in the past 12 months, the Ulster Fry Index is still 8.1 percent lower than it was five years ago. Though it is 25 percent higher than 10 years ago. Since the EU-Referendum in June 2016, the Ulster Fry Index has increased by 6.8 percent. Richard Ramsey says that the Ulster Fry Index is a bit of fun but contains an important economic message: “Food makes up a significant proportion of household spending. ‘Food and drink’ is also a key sector of the Northern Ireland economy. 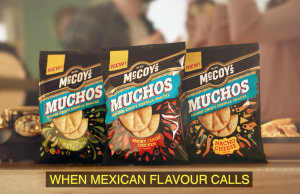 So, understanding how the price of food items is changing gives us some insight into both the current state of consumer finances, and also some of the challenges facing the agri-food industry,” Mr Ramsey says.